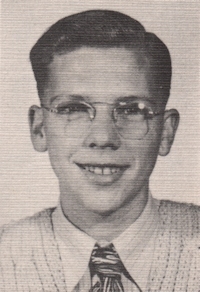 Obituary – Schurkens, Bill Lee « Perry High School Alumni Association, Inc.
Bill Lee Schurkens, 85, passed from this life on January 28, 2016 in Sand Springs, OK. Funeral services have been entrusted to the care of Palmer Marler Funeral Home and a celebration of Bill’s life will be held at 10am on Monday, February 1, 2016 at the Palmer Marler Funeral Home Chapel with interment following at St. Rose of Lima Catholic Cemetery in Perry. Billy Lee Schurkens was born on May 6, 1930 in Ponca City, OK to Leonard and Beatrice (Skeen) Schurkens. He was raised and attended schools in Perry. Following his graduation from Perry High School, Bill attended Northern Oklahoma College in Tonkawa, OK where he earned an Associate Degree in Engineering. He spent several years working at First National Bank in Perry before accepting a position as a petroleum field engineer, working in New Mexico and Oklahoma. Bill enjoyed hunting and spending time with his dogs Pat and Legs and he was an avid guncollector in his younger years. He was a member of the National Rifle Association, the Society of Petroleum Engineers, Wildlife Federation, and was a member of the Sportsman’s Legislative Action Committee. He was preceded in death by his parents Leonard and Beatrice Schurkens. He is survived by his children Dana Smith and husband Kevin of Paradise Valley, AZ and Kurt Schurkens and wife Robynn of Pinetop, AZ. He is also survived by 5 grandchildren and 7 great grandchildren, as well as a cousin Phyllis Wurtz. Donations may be made in Bill’s name to St. Rose of Lima Catholic Church in care of Palmer Marler Funeral Home 203 Fir St. Perry, OK 73077.